Again full review in due time but if you read the latest 3-4 Furst novels (especially Blood of Victory, Dark Voyage, Spies of Warsaw) you will recognize the themes - relatively successful and charismatic male lead, femme fatale(s), less glamorous but more intellectual woman as main attraction, the dangerous spying game against the Nazis, the quiet assassins, the well meaning but unable to do too much officially persons of importance, the Balkan corruption and of course here Paris is as much a star as the main characters and we get too see a movie production to boot too. 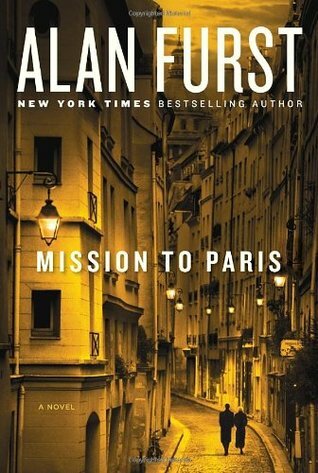 Sign into Goodreads to see if any of your friends have read Mission to Paris. Thanks for reminding me I need to read more Alan Furst! I would have never know about these books if it wasn't for your reviews. I've read the first one and loved it. I ended up buying all the rest except for Mission to Paris. I'll have to get it soon. Great! I am happy you have enjoyed the first you tried and I hope you will like the rest. I'm tempted to give Furst a try. could I start anywhere in the series or is it better to read them in order of publication? It does not really matter except for the two Casson books, The World at night/Red Gold which follow one another. Thanks so much for such a comprehensive & thoughtful review. I appreciate the fact that you can love a frog, metaphorically speaking, even though it's got a few warts. I don't kind a certain amount of predictability, if the likely alternative is to have the author, deus ex machina, drop a solution to the mystery that's got absolutely no real-world credibility. I snagged a free copy of this book via Goodreads promotional collaboration between publisher and author, so when it arrives I've only got my time invested. Paris is a wonderful venue, especially pre-war Paris. You could cut the tension of darkening war clouds with a knife, meanwhile the eclectic artist & author community kept cranking out progressive jazz and passionate poetry or fiction that could bring the audience to tears. Perhaps I was simply born too late, because I would swap life today for Paris in the 1930's even if I knew full well that I'd have a bullseye on my back as an opponent of Fascists under any disguise.